The joint naval exercise will consist of two stages - coastal and naval. The Russian-Indian Indra NAVY-2016 naval exercise will be held on December 14-21 in the southeastern Indian coastal city of Visakhapatnam and in the Bay of Bengal, a military spokesman said Tuesday. Russian Eastern Military District spokesman for the Pacific Fleet Capt. 2nd Rank Vladimir Matveyev said the dates and the location were agreed during the latest meeting of Russian and Indian officials, charged with preparing the event. ‘During the conference, the Russian and Indian side agreed to hold the exercises in the period from December 14 to 21. The Indra NAVY-2016 will consist of two stages - coastal and naval," he said. The coastal part will be held on December 14-18 in the city of Visakhapatnam, while the naval will take place in the Bay of Bengal on December 19-21. A source in India’s Navy earlier told Russian reporters that at least three vessels from each side will participate in the drills. The Indian task force will consist of a destroyer, a corvette and a tanker, and also naval air support. Spokesman for the Eastern Military District, Colonel Alexander Gordeyev, told TASS earlier that the Russian side will send a large anti-submarine ship of Project 1155, a destroyer of Project 956, the Kamov Ka-27 anti-submarine helicopter, a tanker and a sea tug to the drills. 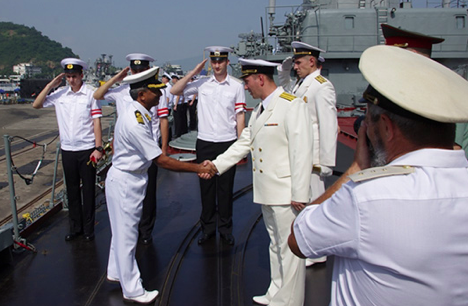 The first Russian-Indian naval exercises were held in May 2003. The name Indra was coined in 2005. The Indra exercises were held in 2007, 2014 and 2015.